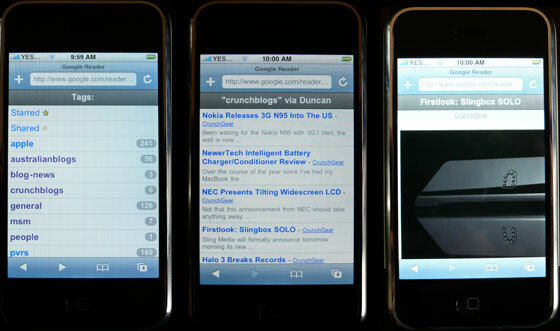 Google has plugged the Google Web ToolKit demonstrating an iPhone specific version of Google Reader. The iPhone Reader combines the Google AJAX Feed API with a user interface geared for use on the iPhone. We haven’t reviewed the Google Reader for iPhone before (not to be confused with the Web Toolkit Version) so I gave it a spin. It’s not the most stunning iPhone specific site I’ve used so far (Facebook holds that honor for me) but it does work, and work well. I heavily use tags in Reader to categorize content; unfortunately the only way to quickly go back and forward between tags is by scrolling to the bottom of each post then tapping on a small link, as opposed to a more usable button that is always present. Reader for iPhone also doesn’t discriminate based on tags with content and without, so a tag list includes every tag you’ve ever used in Reader, meaning you have to scroll past them to return to the navigation options. I shouldn’t complain too much however, being able to access this data on an iPhone is still light years ahead of my previous Nokia experience. Here’s hoping Google has future improvements planned for it. See also our coverage of Netvibes for the iPhone here.